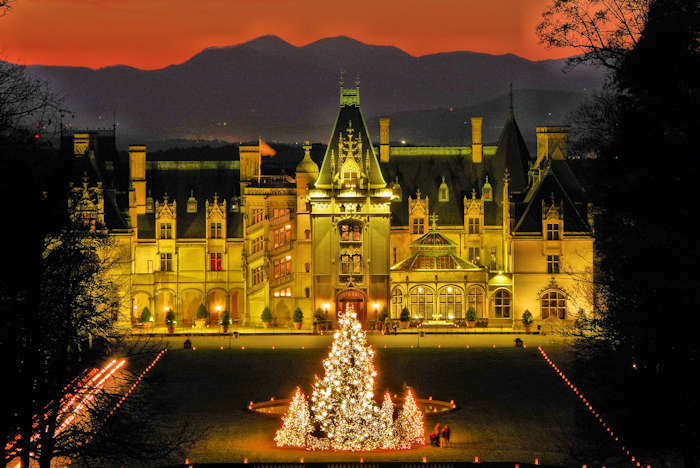 Pick the perfect Christmas tree for you home and have a great holiday outing at one of the "choose and cut" Christmas Tree Farms near Asheville. You select the tree. Then they will cut it, bale it and tie it on your vehicle. Or you can use their bowsaw and cut it yourself! Our North Carolina Fraser fir tree production ranks second of any state in the United States. Since they grow best above 3,000 feet elevation (cooler like the North Pole), farms are a short and scenic drive from the city. Our top two picks are in nearby Waynesville. This choose and cut farm with mountain views is an easy drive from Asheville and just a few miles from I-40. They specialize in high quality Fraser Fir trees, 5-18 feet. Located at the foot of the Great Smoky Mountains near Maggie Valley and Lake Junaluska. Easy paved access, lots of parking, restrooms, handicap facilities. Free refreshments including cider and hot chocolate in heated tent. Also buy fresh wreaths, roping and tree stands. Stay the night in one of their rental cabins on the farm. Dogs allowed on leash. Directions from Asheville (30-40 minute drive): Follow I-40 west to exit 20. Go 3.5 miles on Hwy. 276 South, Turn right onto Hemphill Road, cross bridge & immediately turn left onto Boyd Farm Road. Go to their Web site. 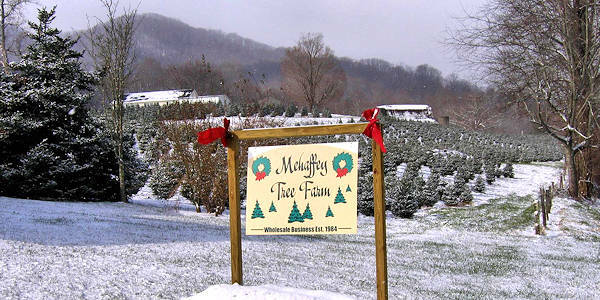 This highly rated wholesale tree farm opens to the public for a few weeks each year. Find easy parking, restrooms, and free refreshments in a heated building. They have five to 14 foot trees, plus wreaths, roping and tree stands. Directions from Asheville (30-40 minute drive): Follow I-40 west to exit 20. Travel 3.1 miles on Hwy. 276 South, Turn right onto Grindstone Rd. Travel 1.3 miles on Grindstone Rd. to Hemphill Road, Turn right on Hemphill Rd. Go to their Web site. Note: Call before you go to make sure they are open! Open the weekend before Thanksgiving, Thanksgiving Day, the Friday and weekend after Thanksgiving Day, and first two weekends in December; from 9 AM until dusk. 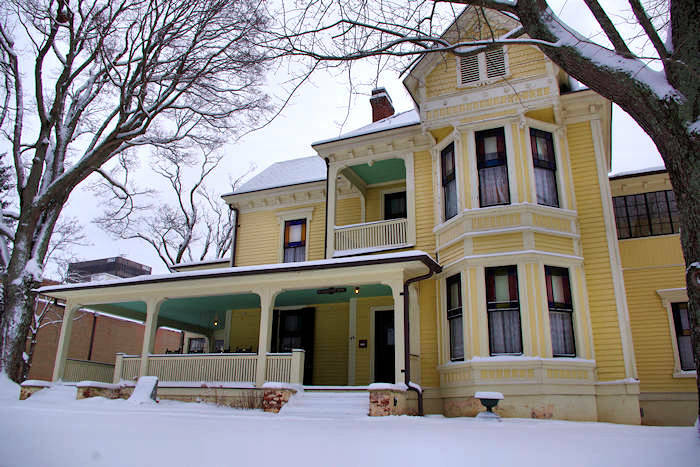 Enjoy warm accommodations, hot cocoa, hot cider and cookies. They will cut, bale and load your tree once it’s selected. The farm is located 11 miles from Banner Elk, approximately 65 miles northeast from Asheville. They also have wreaths and garland, along with special greenery requests. Located near downtown Elk Park (8 miles from Banner Elk), this farm has weekend hay rides, cider, hot cocoa, and great photo spots for family memories. Bring your tree stand and they will fit your tree, bale it and tie it atop your car. Opens mid November. Mon-Fri 1-4 PM, Sat 9-5, Sun 12-5. Elf Village open Sat & Sun. Closed Thanksgiving. Open Friday after Thanksgiving 9-5. 80 acres of Fraser Firs, 3-12 feet. 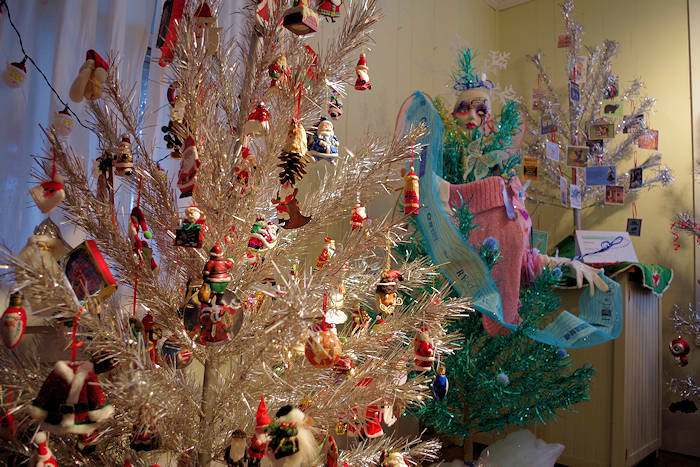 Fisit the elf-sized collection of houses in the Elf Village, where kids can make crafts, visit Santa Claus, write and mail letters to Santa, hear holiday stories, roast s’mores and even take horse and carriage rides on Saturdays. Overlooks Lake Glenville, 6 miles north of Cashiers & 22 miles south of Sylva. 68 miles SW of Asheville. This tree farm is a short distance off I-26 near the North Carolina/Tennessee line. Be surrounded by hillsides of trees and fields with cows, goats, and a llama or two. They grow 80,000 Fraser firs on 55 acres of their 300 acre farm. Wreaths up to 36 inches. About 41 miles N of Asheville. 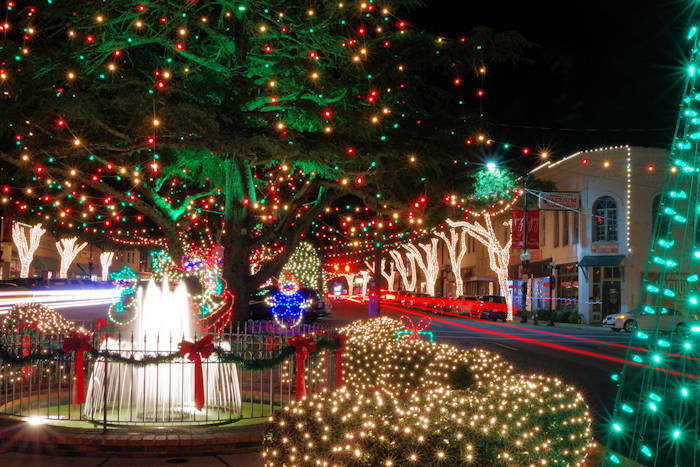 Head to the high country, the Christmas Tree Capital, and take home the perfect tree. Includes lodging in Banner Elk, full breakfast, dinner discount and a choose & cut 7-foot Fraser fir at a farm. Nov 17-Dec 9. 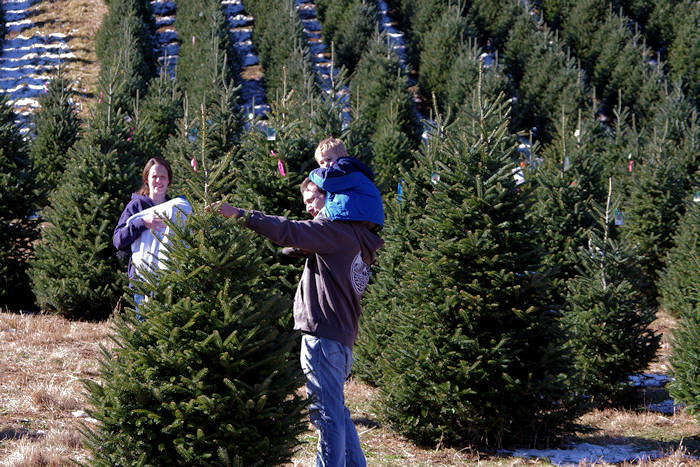 North Carolina has an estimated 50 million Fraser fir Christmas trees growing on over 25,000 acres. 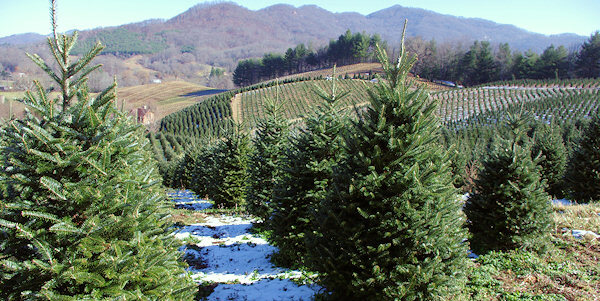 Fraser fir is grown by 1,600 NC growers in the higher elevations of the Western North Carolina counties which include Alleghany, Ashe, Avery, Buncombe, Haywood, Henderson, Jackson, Macon, Madison, Mitchell, Swain, Transylvania, Watauga and Yancey. North Carolina produces over 19% of the real Christmas Trees in the U.S, ranking second in the nation in number of trees harvested. The North Carolina Fraser fir has been judged the Nation's best through a contest sponsored by the National Christmas Tree Association and chosen for the official White House Christmas tree many times. Our Fraser fir is the most popular Christmas tree in North America and is shipped into every state in the U.S. as well as the Caribbean Islands, Mexico, Canada, Bermuda, Japan and other points all over the world. Fraser fir has soft, pleasant-to-touch needles, incomparable needle retention, long lasting aroma, and more pliable yet stronger branches for even the heaviest ornaments.